In the first article I discussed testing and debugging Caché web applications with external tools. Second part would cover Caché tools. First of all, if you're debugging and especially developing front-end application you don't need caching. It's useful on a live system, but not during development. To disable logging for a web application you need to go to: SMP → Menu → Manage Web Applications → <Your Web App> and set Serve Files Timeout setting equal to 0. Then press "Save" button. There are also options to record performance. Results can be written to file or viewed from View Event Log tab. Note: use tracing if you're can know what's wrong and can easily reproduce the problem. Use logging for statistics gathering, performance profiling, etc. Additionally most web servers provide logging and performance tracking tools. 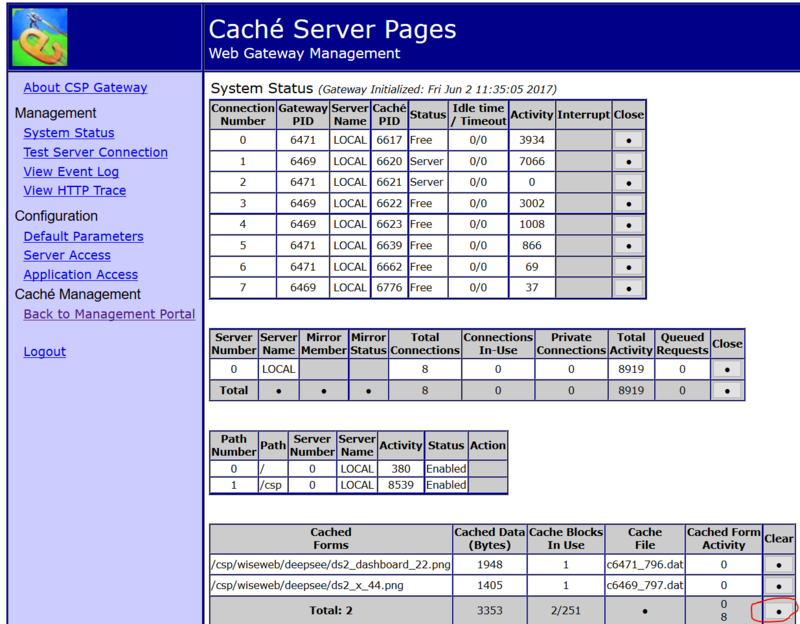 CSP Gateway is useful in determining network problems and tracking performance, but to log what's going on inside Caché other tools are required. One of the more versatile of such tools is ISCLOG. Documentation. /// A string indicating HTTP method used for this request. /// and extension, but not including the query string. /// originated, as determined from the HTTP_USER_AGENT header. /// A string indicating the MIME Content-Type of the request. /// it defaults to the character set of the page it is being submitted to. /// the secure https protocol. False for a normal http connection. This is a very basic sample, it can and should be extended to record comments, variables or anything else you might need. The main advantage of this approach is an ability to execute SQL queries over recorded data. For more info on building your own logging system please refer to this article. Event class is class which defines the interfaces that are called during the lifetime of a %CSP.Session object. In order to use this you should subclass %CSP.SessionEvents and implement the method code you wish to be executed. Then within the CSP application configuration set the event class to the class you have created. 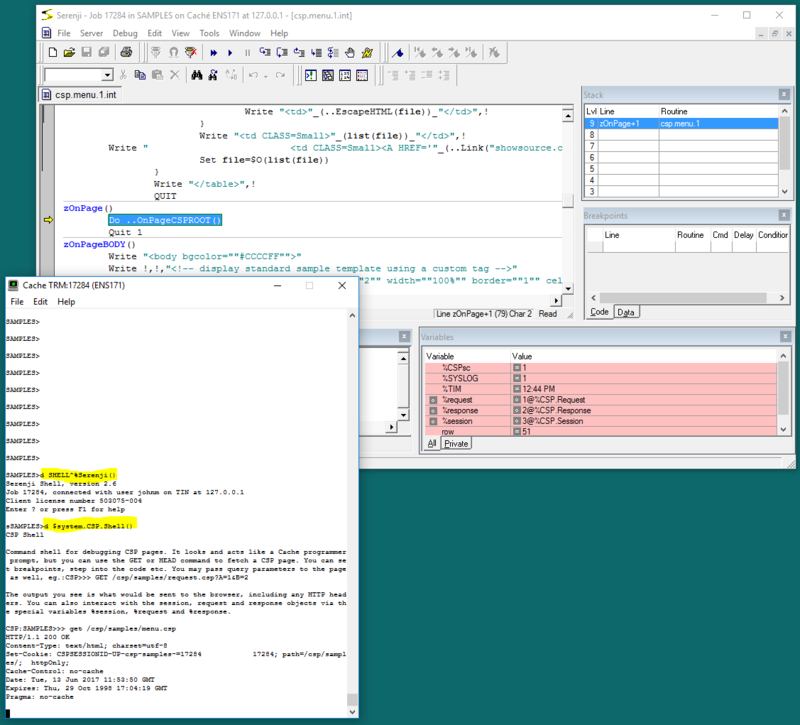 For example custom logging discussed above can be called from these methods. There are many tools you can use to debug your web application. Choose the best one for the task at hand. What are your tips and tricks to debugging web applications from Caché? You are missing the CSP shell. The output you see is what would be sent to the browser, including any HTTP headers. You can also interact with the session, request and response objects via the special variables %session, %request and %response. This can then be used with the command line debugger (zbreak/break) to step through your csp/rest code. Serenji can also debug pages initiated from the web browser.